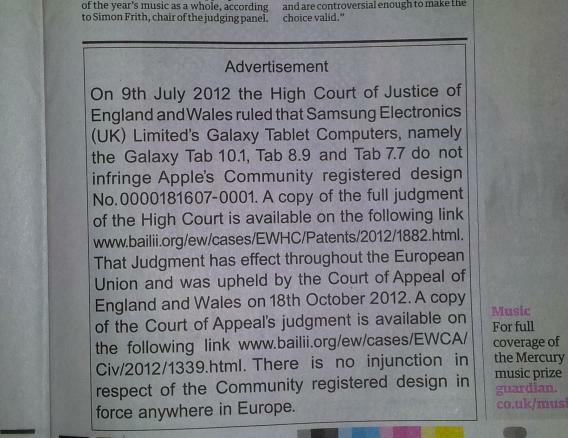 Apple Samsung apology: New ad in Guardian drops the snark, leaving only legalese. Because apologies are more sincere when they’re filled with random capitalization, desultory punctuation, and long URLs. The story so far: After winning a big patent lawsuit against Samsung in the United States, Apple loses its case in the United Kingdom. A U.K. judge orders the company to publish a notice of the decision on its website and in major British newspapers. Apple complies in the most smart-alecky way possible. Judges are not amused, order a correction within 48 hours. This morning, a fresh batch of Apple ads cropped up in British newspapers, and blogger Tim Acheson snapped the above picture, from page 5 of The Guardian. On first glance, it seems the company has finally dropped the editorializing about how Samsung’s products are “not as cool” as the iPad. Of course, that was the only part of its original notice that was written in plain English. What’s left is legalistic gibberish, and ungrammatical at that. Have you ever seen, in any official Apple marketing, a paragraph as incomprehensible and poorly edited as the one above? Would anyone reading the Guardian over tea in the morning read this and think, “Oh, I see, the Galaxy tablet isn’t a ripoff of the iPad?” Is there any doubt whatsoever that Apple intentionally made this as unreadable as possible? On the other hand, is there any way the judges can prove it?